Honey mustard reminds me of childhood, specifically this restaurant, Ray’s on the River, outside of Atlanta. Apparently, it opened in 1984. We moved there in 1985, and my dad bought a piano “for the family.” What that meant was that my brother and I were signed up for piano lessons, with mandatory yearly recitals that involved being dressed up, playing horrible dreck in front of a crowd of the parents and other kids, and then going out to dinner as a family. While piano recitals were decidedly not my thing (I was a competent student, but I’m not a performer), this was the kind of dinner out that I actually really liked. We always went to Ray’s for “nice” dinners out — celebrations of some sort. Ray’s had a jazz band in the bar (and this was well before children were banished from bars — we got Shirley Temples and got to listen), a view of the muddy Chattahoochee River, and the best chicken fingers I’ve ever eaten. They had a crispy, light, almost tempura-esque coating which I never could replicated, not even with all the allergens in the world. They were served with a “fancy” honey mustard sauce, which was not like the gluey opaque salad bar version of honey mustard (which is mayonnaise-based). 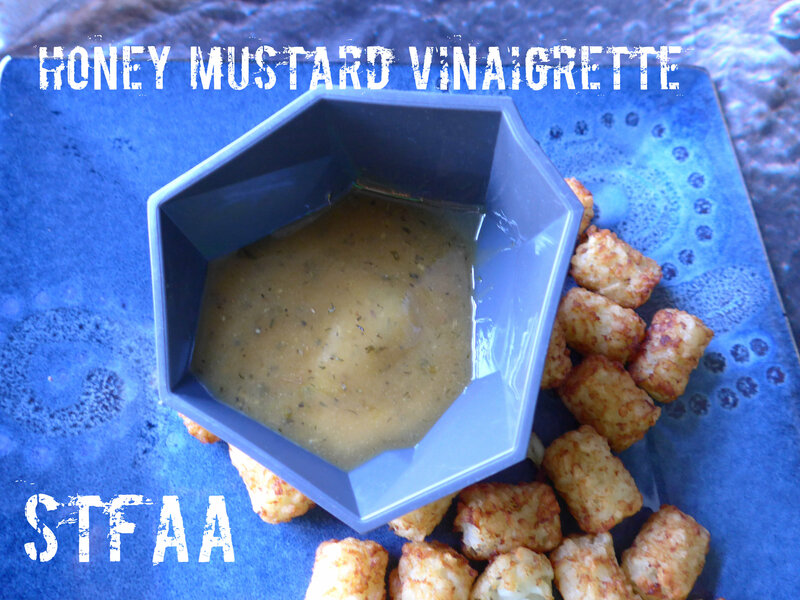 I’m sure this sauce had real honey and real mustard in it, and not a lot more — and this recipe is my attempt to recreate this flavor of my childhood. 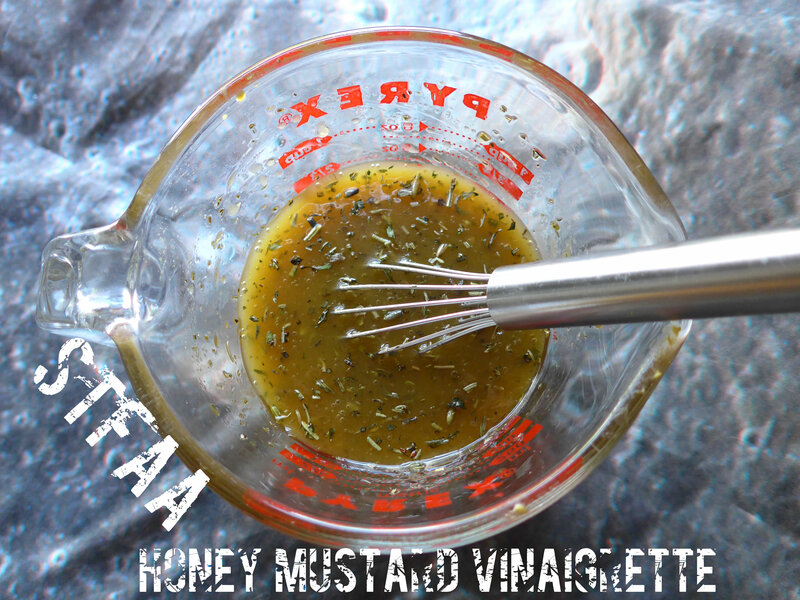 This honey mustard is intended primarily as a salad dressing, but I’ve also cooked salmon, chicken, and potatoes in it with great results. Pick your herbs based on your destination, and you’ll do fine — I prefer the herbes de provence on chicken and salad, and the dill for fish, but the extra dressing never goes to waste no matter which version I make. Honey Mustard. It’s better than piano recitals. This sweet and savory classic gets an adult update with great herbs. Measure ingredients into a bowl (I use a glass measuring cup, as the spout is good for pouring the dressing/sauce on a salad or dish). Mix well with a whisk. The order of the ingredients is purposeful -- if you measure the olive oil first, the honey and mustard will slide right out and you can use the same measuring spoon for the whole thing. If you want to use this as a dipping sauce, I'd suggest making it the day before. A night in the fridge thickens it up quite nicely.